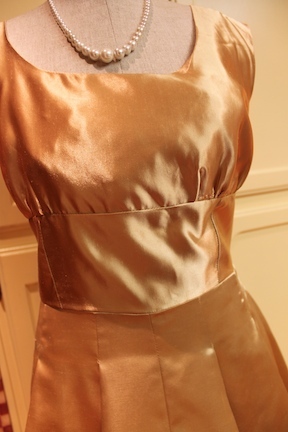 This gold dress was inspired by my 17 yr old daughter. She was elected to be Columbus Day Queen in 2009 and I needed a dress. I knew we would have many formal events over the next year, so I decided to try my hand at sewing something formal. Normally I would go out and spend a couple of hundred on a new outfit, but this time I wanted to make it. 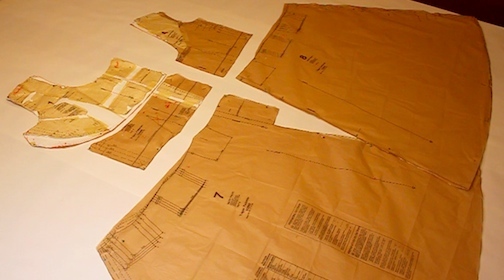 I had planned all along to sew this Vogue pattern several times. I knew I wanted a summer dress or 3, and a formal dress or 4. We would have 12 formal events over the next year, so 4 would give me plenty of variety. 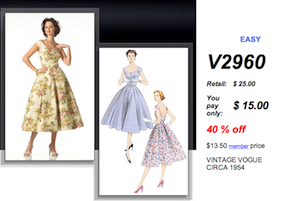 Again the pattern would be the Vogue pattern that I love. By now i've done 4 dresses and 1 top with this pattern, and the last one "Brown Polkadot Dress" came out great. I also had learned so much from my sewing teacher by this time, that I was feeling really confident. The fabric was not an easy choice. So far (on these 6 dresses from the Vogue pattern), I had used sheets, table cloths, napkins, curtains, clearance price fabric ($1 yard), or fabric I had owned for years. This time I was going to need to buy some fabric, probably not on clearance, but I did have my handy dandy 40% off coupon from Joanne's Fabrics. Still it is more nerve racking when it's time to cut into new fabric you just spent $50+, versus old sheets and curtains, and this is not an easy pattern. After much deliberation I settled on the gold. Originally I was planning to use the other side, which had a much more retro look to it, but after a crack from my husband about it looking like curtains. I flipped the fabric and went with the shiny gold side instead of the dull side with the horizontal grain. I lost a lot of the retro look I was going for but I still liked it. 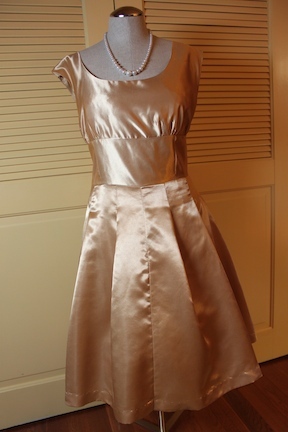 The dress came out well enough to wear, but throughout the evening the neck line got bigger and bigger. Long story short, I didn't stay stitch the neck line, so it stretched. Some fabrics can get away with it I guess, but not this one. 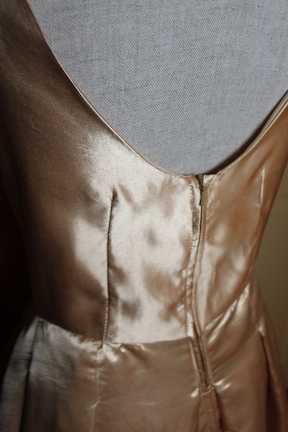 At this point, I need to take the lining apart from the dress to properly go into the neckline and stitch it. Just not ready to go back to it yet. I do like the dress, but felt a lack of support. I may need to make a cloth belt to finish it off and add a little more shape. Also make a proper full slip to give the skirt more fullness. 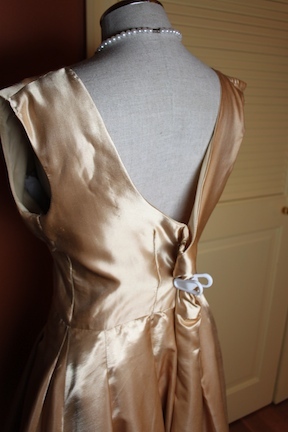 Since these photos show the dress on a size 4 dress form, and are pinned and clipped to make the dress look at it's best, some of these details may not be obvious.